What is the Cause of Parkinson's Disease (PD)? Genetics – Some research shows that Parkinson’s can sometimes run in families, passing a specific genetic mutation from one family member to the next. Having a close relative with the disease may increase a person’s chance of developing it, but the risk is comparatively small unless many family members are living with the condition. Environment – Certain toxins or other pollutants are also believed to increase the risk of developing Parkinson’s. For instance, individuals who routinely work with and are frequently exposed to pesticides and herbicides may be at higher risk for developing the condition. 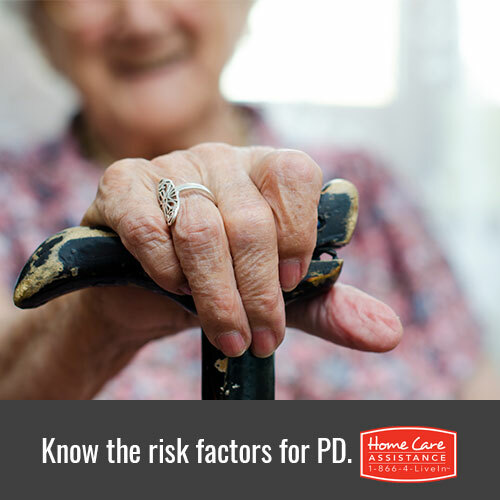 Researchers have also noted certain risk factors associated with Parkinson’s. For example, the condition is more common in men than in women and is often more common in middle-aged or older adults. Most people don’t develop Parkinson’s until they’re at least 60 years old. If your senior parent or loved one has recently been diagnosed with Parkinson’s, in-home care in Harrisburg may be the perfect solution. This unique service provides seniors with the tailored level of care needed to remain safe, comfortable, and as independent as possible in the comfort of home. For more information about professional Harrisburg Parkinson’s home care for a senior loved one, call (717) 540-4663 and request a complimentary, no-obligation consultation with Home Care Assistance. We are a trusted, local provider of home care and our Care Managers are here 24/7 to answer questions and offer a listening ear. We look forward to hearing from you.